Foreshore Technology have added dedicated support for Valeport's SWiFT SVP (Sound Veloctiy Probe). 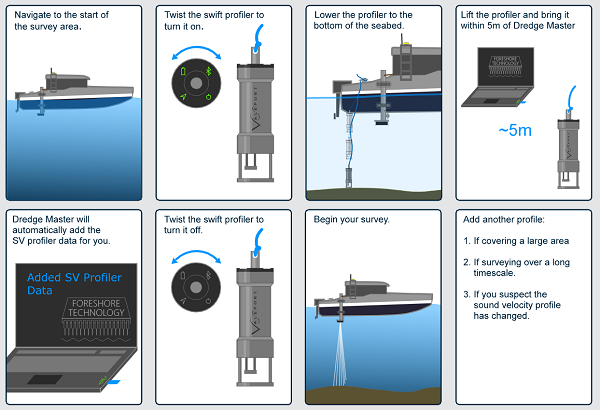 The Dredge Master Multibeam product makes use of the SWifT's bluetooth interface to automatically load sound velocity profiles from the device. The operator simply needs to bring the SWiFT SVP device within 5m of the computer and the data is automatically loaded and applied to the current survey project. This enables the operator to quickly take sound velocity probes during the survey and have them applied to the real time processing immediately without having to touch the computer. The inforgraphic below explains the process. (click for a larger view).